The Dolfi sculptures in wood and bodies of crucified Christ is processed in accordance with the best tradition of woodworking. In this way the sculptures have a strong emotional connotation that is transmitted through the strong expressiveness of the subjects represented. These sculptures with religious background are very suitable for household use, but, given the variety of sizes and decorations and the possibility of customization, they are ideal for use in churches, monasteries and religious congregations. 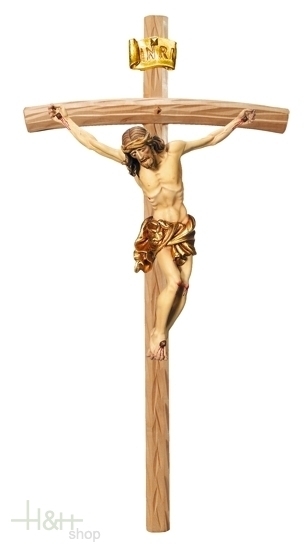 Traditional wooden crucifix representing the Passion of Jesus Christ. The sculpture is very thorough and every detail has been carefully worked to give, through the wood, the most realistic details. Dimensions vary allowing the use of this sculpture for churches, monasteries or religious processions. The Apple Balsamico is a special precious object in Luggin's vinegar assortment. the long and careful storage in barrique barrels the Balsamico receives his discreetly sweeten, mild taste which delightfully fits to meat and fish dishes. The raspberries cultivated according to organic-criteria are pressed by family Luggin to juice and then are carefully processed to pure vinegar. This raspberry vinegar arouses enthusiasm with a fruity raspberry aroma. He is liked very much to coloured salads.